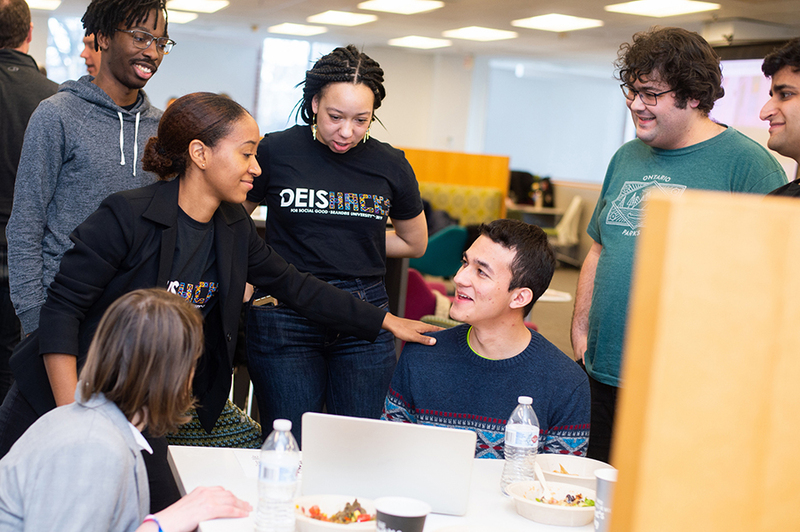 The 'Deis Hacks mission: develop innovative, real-world design solutions in less than 24 hours. It's like Uber, but for pets. 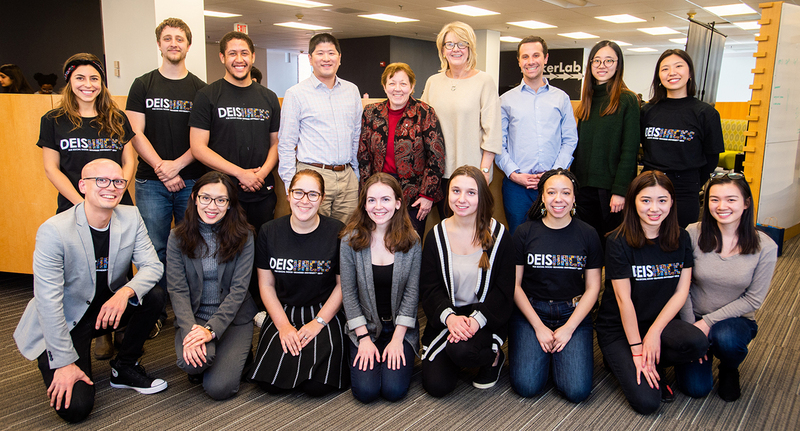 More than 60 students put their creative problem-solving skills to the test at 'Deis Hacks 2019, a hackathon for social good sponsored by Brandeis International Business School (IBS) and Brandeis MakerLab. Held over the weekend of Jan. 26-27, participants formed teams and were assigned unique challenges facing a dozen local nonprofits from Waltham and Boston. The hackers' mission: develop innovative, real-world design solutions in less than 24 hours. Led by Brandeis IBS student Gloria Zheng, Accelerated MA '19, the winning team proposed a number of creative ideas to improve programming, communications and quality-of-life at Leland Home, which serves low- to moderate-income seniors in Waltham. Among their proposals was a pet-sharing program inspired by the popular ride-hailing app Uber, along with a revamped website and online volunteerism schedule. The team earned $1,000 for their first-place finish. 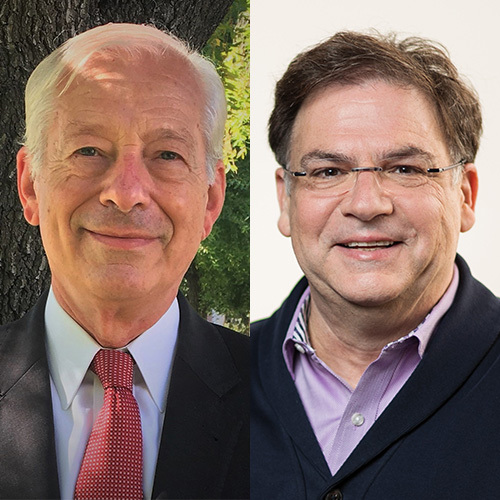 "Social good is ingrained in the culture here at Brandeis as much as quantitative analysis," said Gene Miller, an adjunct professor at Brandeis IBS and event co-organizer. 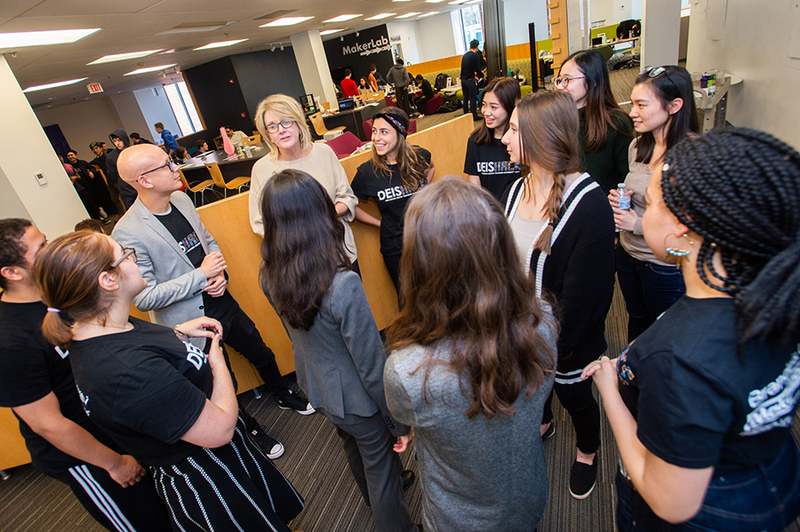 "Our students loved the idea of a hackathon that exposed them to new skills while at the same time has a positive impact on their community." 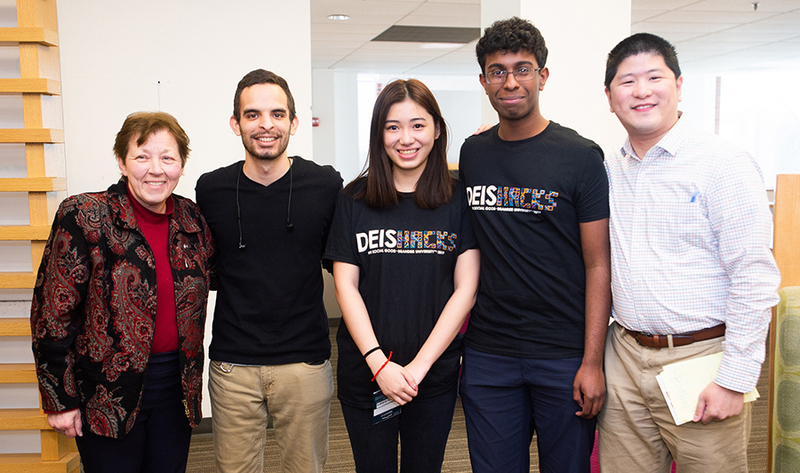 Members of the winning team pose with Waltham Mayor Jeannette McCarthy, left, who served as a hackathon judge. 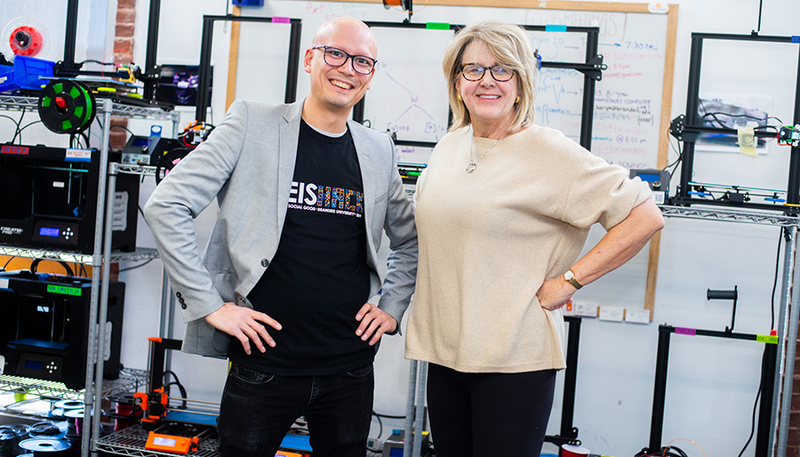 'Deis Hacks 2019 organizers Ian Roy, founding head of Brandeis MakerLab, and Brandeis IBS Adjunct Prof. Gene Miller. Hackers teamed up to help local organizations from Waltham and Boston, including the Waltham Boys and Girls Club, Charles River Museum of Industry and Innovation, Africano and the Boston Police Teen Academy. 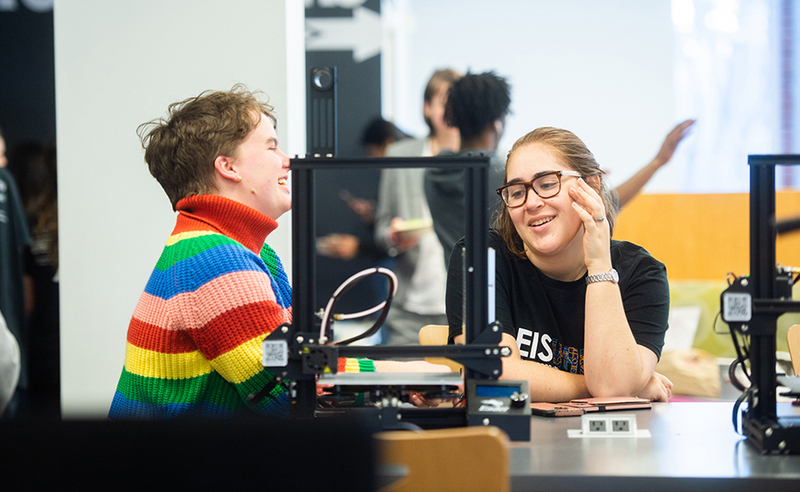 The teams worked through the night using the MakerLab’s broad range of resources, including 3D printers and scanners, virtual-reality headsets, drones, and more. The winning team presents its marketing and programming solutions for Leland Home. 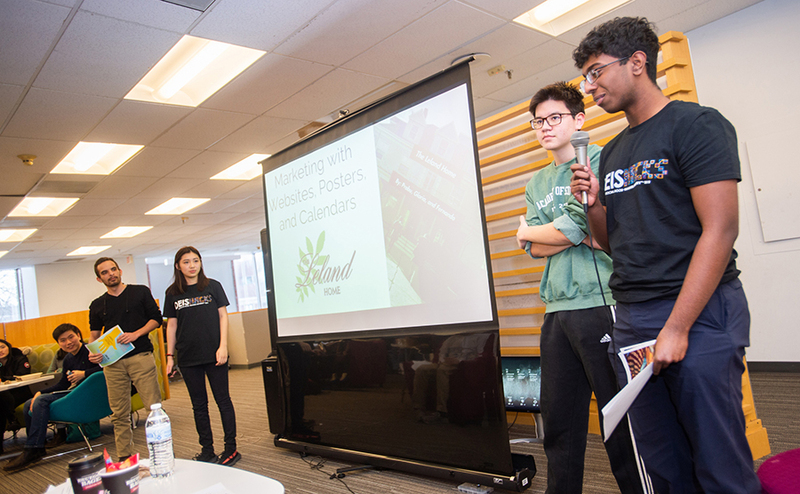 Hackathon challenges were presented by students in Miller's course, "Field Projects: Consulting in Social Innovation Impact." 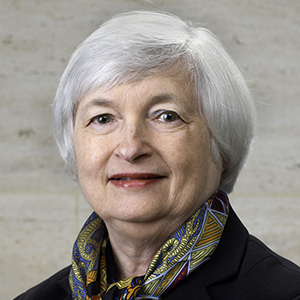 The course pairs students with the boards of local nonprofits.